Kenya first entered the world at a drive-thru zoo. When Vicky first saw her at 3 weeks of age, Kenya constantly screamed in distress and had begun to lose her hair. 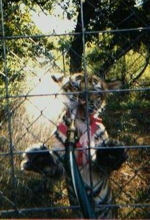 For two weeks, Vicky looked for ways to help the small, tiger cub. The second time Vicky saw her, she was 5 weeks old, still losing hair, and still in desperate need of vet care. 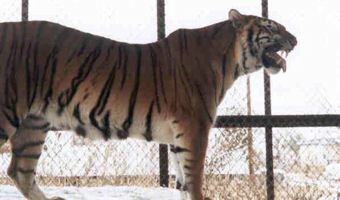 Her owners were displeased because the tiger cub was now financially useless to them. Seeing the beauty in Kenya and feeling empathy for her, Vicky brought her home. At 5 weeks, Kenya already had stomach and immune system problems and was infested with fleas. After aggressive medical treatment, a proper diet and a lot of love and pampering, Kenya regained perfect health. A strong, immeasurable bond formed between Vicky and Kenya, one that would never be broken. Every morning, Vicky visited Kenya’s cage. Once the cage was clean, the fun began. Chuffs of good morning would start the day. Kenya was beautiful, sweet, playful and very gentle with Vicky. All throughout the day and night, Kenya and Vicky talked to one another. With Kenya in her enclosure and Vicky on the outside, they played hide and seek, tiger-style. Kenya would chase Vicky, jump in her pool and splash her. She would also entertain Vicky by playing with her toys. Kenya had a funny way of hugging her tree and turning somersaults when she wanted to show off. Sometimes, Vicky would sing to Kenya or just sit with her, admiring her beauty. At night, Vicky would sit with Kenya while she ate because Kenya hated eating alone. Tragically, Kenya passed away on February 13, 2001 when she experienced heart complications during a routine spay surgery. The impact of this tragedy will be felt forever in the heart of her beloved Vicky. Kenya brightened the lives of all that met her during her short life, and her spirit and legacy live on as the inspiration for In-Sync Exotics. Kenya was beautiful, sweet, playful and very gentle with Vicky. All throughout the day and night, Kenya and Vicky talked to one another. With Kenya in her enclosure and Vicky on the outside, they played hide and seek, tiger-style. Kenya would chase Vicky, jump in her pool and splash her. She would also entertain Vicky by playing with her toys. Kenya had a funny way of hugging her tree and turning somersaults when she wanted to show off. Sometimes, Vicky would sing to Kenya or just sit with her, admiring her beauty. At night, Vicky would sit with Kenya while she ate because Kenya hated eating alone. Tragically, Kenya passed away on February 13, 2001 when she experienced heart complications during a routine spay surgery. The impact of this tragedy will be felt forever in the heart of her beloved Vicky.